Parched, withered and feeling the burn is just another day in the life of a U.S. farmer this summer. The unprecedented heat wave pulsing across the Midwest Corn Belt is forecast to significantly reduce yields, impact a variety of other grains and seeds, and even raise prices in your local market for edible beasts. Though global warming enthusiasts are careful not to make too much of the current heat wave, it does add fodder to the debate and even more so for those who argue for more genetically modified crops (GMOs) able to withstand such droughts. It’s unclear if the general public will ever get comfortable with the idea of foods – plants and animals both – grown or reared from GMO seeds, feeds, and stock. The whole idea of gene transfer and tinkering with nature, not to mention the big multinationals that seem to control it all, just have people freaked out about Frankenfoods. But plant microbiologists might have a way around the problem – or at least until we decide their new idea is a problem as well. Messing around with a grass (Dichanthelium lanuginosum) that grows around geothermal hot springs at Yellowstone National Park, researchers discovered that if they sterilized the seeds before planting (that is, removed all the associated fungi and bacteria), the grass would no longer grow in the 160 degree Fahrenheit (~70 °C) environment. In other words, there was something going on between the plant and the bacteria and fungus inside and clinging to the seeds that made it possible for this plant to live in such an extreme environment. That was 2002. Fast forward to 2008 and those same researchers put two and two together and hypothesized that if they took wheat seeds, which normally grow at 100 degrees Fahrenheit, sterilized them, and covered them in bacteria and fungus harvested from the super weeds growing near the geothermal springs, they would grow. Not only did the spore-treated wheat grow at the scorching 160 degree Fahrenheit of the geothermal springs, it also required 50 percent less water than normal! They have also done similar eco-gymnastics with other plants as well. Now, you don’t need to be a plant biologist, white-coat lab technician or one of those farmers feeling the heat to wrap your head around the ramifications of this insight. If something as simple – well, not that simple – as swapping seed microbiomes (all the microbes and their genes from the seeds) could help crops weather the heat and do so with less water, this might provide an alternative strategy to using GMO seeds. At least those GMO variants concocted for drought resistance (pest resistance is another matter all together). The microbiome swapping research among plants clearly demonstrates that microbes play an important and symbiotic relationship with the plants. Although the exact mechanisms are still being sorted out, the researchers note that the plants cannot do it alone. 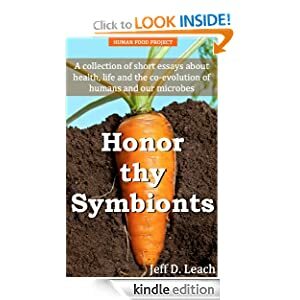 But the idea of swapping microbiomes among various plants – that is, the microbes and their genes – is essentially what folks concerned with GMO foods in general are, well, concerned about; gene transfer. Will this fact doom this creative and all-natural emerging subfield in crop science and agronomy? I hope not. It’s also interesting to note that throughout human evolution our ancestors’ gut microbiomes were like huge gene vacuum cleaners, sucking up and sampling new gene pools as we moved from nesting in the trees to making a living on the ground. Perched high in the canopy, our earliest ancestors consumed the microbiomes associated only with the leaves, fruits, insects and other edibles who shared this aerial habitat. But as we began spending more and more time on the ground – and eventually figured out how to explore and exploit subsurface resources like tubers – we, I should say our gut microbiome – was exposed to a cornucopia of new bacteria and their genes. From this new metabolic network, it was not always necessary to acquire whole bacteria. Acquiring some of their genes was good enough as it’s the genes, not the bacteria themselves, that is what’s most important after all. With these news genes, we acquired the ability to more efficiently degrade novel foods, such as the new starches and proteins that our gut microbiome did not encounter in more elevated previous addresses. So as the range of our ancestors expanded with each new technology (digging sticks, weapons, fishing nets, clothes, etc. ), we continued to experience new metabolic networks and borrowed from them what we needed. The evidence for gene journey is discernible today in the structural (taxonomic) and functional (genes) differences in the gut microbiome between modern humans and our close relatives, the chimpanzees (we share a common ancestor somewhere around 4-6 mya). While we should demand to know what’s in our food – i.e., GMO labeling should be mandatory – we should also bring all the biological, environmental, social, and evolutionary evidence to the table when discussing these important issues. Given the reality of our evolutionary past, modern humans are best characterized as high functioning zombies deftly controlled by thrifty, shape-shifting microbiomes. Seems our greatest fear may have already transpired. Previous Post Probiotics or Prebiotics: which would Darwin choose? Next Post You Smell Me Dawg? Fascinating. Thanks, and much to think about here, for me! I personally do not feel comfortable with GMO for the results so far have been for pure greed and a lot of knowledge has been lost due to farmers being forced to become uniform. There seems to be very little protection for the small farmer who does not want to use these products and the USA corporations have been abusive in their methods of trying to force the rest of world to use them. Canada / USA are prime examples and in the past the destruction of hundreds of varieties of rice in Indonesia all because corporations wanted to make more money and “SAME” is better when you need to sell on the market. Hopefully consumers will be able to block these advances which tend to benefit the corporations, wipe out the small local farmer and not improve the food supply at all. Other simpler examples in the rush to benefit the few are the destruction of many local crops that tasted much better such as peaches in BC and local varieties of apples that had spots on them. Most consumers today have not tasted quality fruit for a long time and have grown accustomed to bland peaches and strawberries that have as much taste as water with a dash of coolaid in it. Too bad they will never experience the wonder of picking their own from farmers orchards. Many places have banned GMO – hopefully we can keep it that way until there is a better understanding and a more equitable way of ensuring choice. greg, great points. couldn’t agree more. very complicated issue – lots of moving parts.